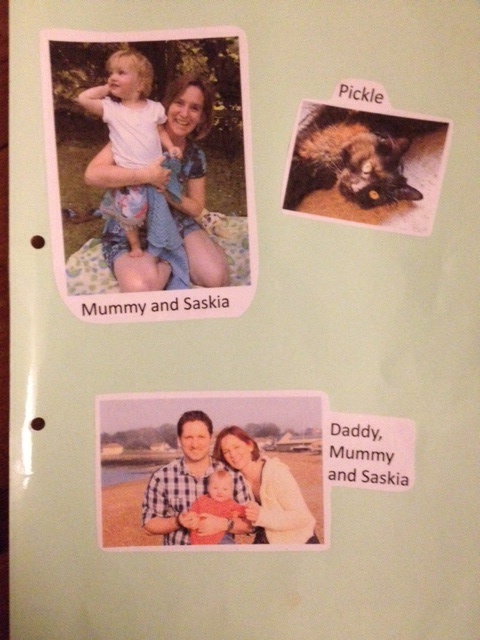 A year and a half or so ago I made a ‘Family Book’ for Saskia, essentially a book of photos of all her main family members. She found it difficult to remember all the different nanas, grandads, uncles and aunties so the idea was to help her sort them all out in her head. It was a very old school Blue Peter-esque affair, involving coloured card, a glue stick and some sticky-backed plastic. It had its day, and then got forgotten at the back of the bookshelf for many months. Recently though Saskia has had it out again, talking her friends through it, now a dab hand at the ‘Name That Nana’. The reason for talking about this book is that it now has several family members in it that have died. I made it not long after Ben’s death and it seemed natural to include him on the first page – there’s a picture of our family as we were (me, Sas and Ben), and how we are now (just the two of us) – and Pickle the cat gets a look in too. Ben will always be Saskia’s Daddy, and so to me its vital that he doesn’t get edited out of stuff like this. At first, it was just Ben that was no longer with us, but since making the book, Ben’s grandad and nana have both also died, and so as we look through the book, we inevitably talk about them, the fact that they’re dead now, and like Daddy, we won’t be able to see them any more because their bodies stopped working too. There are two good things that come from this image of two happy old folks, leaning into each other on the sofa as they pose for a Christmas photo. The first is that Sas can see that she is not alone – other people lose their Daddies, other people die. Families are full of dead people. Death is a normal, natural part of life. Not scary, not strange. On the other hand, the photo also helps me bring home to her the point that most people die when they are very old, not still young like Daddy. I am always mindful that she might worry about me dying, or others very close to her, so when we talk about death I really try to emphasise this. 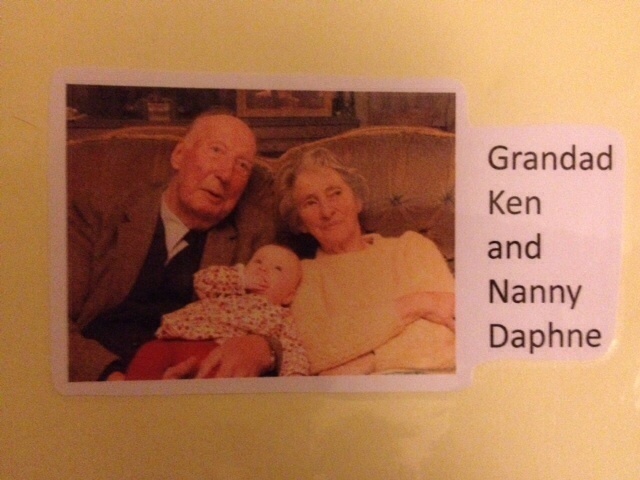 This lovely picture of Grandad Ken and Nanny Daphne helps me to help her understand. Thank you Ken and Daphne. RIP. PS – I know they don’t look that happy in the photo, but that’s just typical old folks posing for photos. They were actually very jolly!